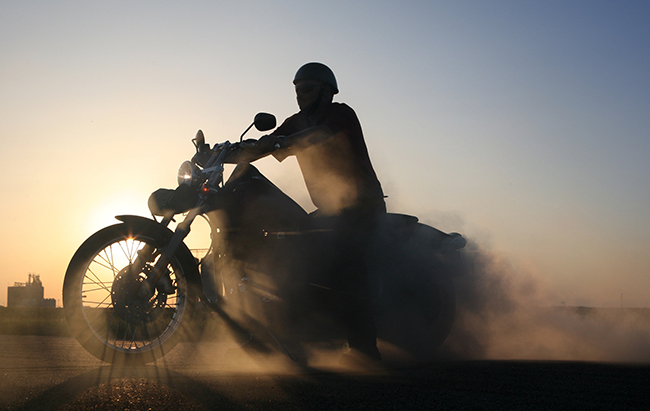 One of the most widespread misconceptions about motorcycles is that they have a shorter braking distance than cars. Riding behind the handlebars of a smaller and more responsive vehicle lead many to believe that they have more control over braking. However, the power-to-weight ratio that gives bikes their acceleration is deceptive; cars actually have a slight mechanical advantage when it comes to stopping distance. Motorcycle braking distance is largely dependent on experience level. Comparison tests between new and experienced riders revealed that the stopping distance for an inexperienced rider is double that of an expert rider who’s familiar with their bike. Stopping capability for cars, trucks, vans, and virtually every bike on the road is 1G. Taking a closer look at motorcycle training tests and stopping exit requirements, braking standards of graduating riders were about .5G, roughly half the bikes’ capability. For reference, the stopping average of an experienced rider is around .7G, while expert riders hover around 1G. How does this translate to braking distance? At a speed of 30mph, the difference between a new and experienced rider’s stopping distance is on average around 30 feet. That’s the length of a bus! Realistically, most riders in traffic will be traveling even faster. At a speed of 45mph, the difference is about 68 feet, which is the length of a semi-truck with a trailer attached. Roadway sloping, tire grip, and weather all affect braking distance as well. Old tires on a wet downhill road won’t stop nearly as effectively as new tires on a dry or uphill road. It’s important to carefully evaluate your following distance in traffic to make sure there’s substantial space to stop. It should be second nature to efficiently hit the brakes on your bike. Maintaining enough following distance to stop, based on your bike’s capability, road conditions and your riding experience, can be the difference in avoiding a motorcycle collision or injury. Motorcycle training will help you get the most out of your bike’s braking capabilities and provide important practice time on closed training courses. It’s A Fine Line is an inclusive community of motorcycle riders advocating one common mission: zero motorcycle deaths by 2030. We want to share videos and stories about motorcycle events, rides, clubs, gear, safety, and training because we believe that together we can save the lives of our friends, our families, and our communities. Close Call – Lane ChangeIs Riding Impaired Worth It? I practice (and teach) “applying” the brakes as opposed to “hitting” the brakes. To “hit” the brakes implies a sudden, abrupt movement of hand and foot…not the preferred reaction in an emergency situation as it increases the likelihood of wheel skids. Practice a slower, progressive brake application at varying speeds in a safe environment as you familiarize yourself with your bikes capabilities, feeling for the weight of bike and rider transferring forward compressing the front suspension and providing maximum weight (and therefore traction) to the front tire’s contact patch with the pavement. This method will consistently give you the shortest stopping distance and when needed, (when there’s no time to think), you will react with what you have repeatedly practiced. Riding safely is way more fun!